Nancy Elizabeth (Jones) Urban was born October 21, 1933 at Beth El Hospital and died December 7, 2017 at her home in Colorado Springs. A Colorado native Nancy grew up in Eastonville and Ellicott, the youngest of 7 children. She graduated from Colorado Springs High School in 1950. She was married to Marvin J. Urban in 1954. She was mother to five. She was companion to Marv as he served the city of Colorado Springs as Caretaker of Palmer Park for over 30 years. She also worked for Farmers Insurance. She is survived by Joe (Pat), Cory & Calla; Sue (Dave) Pelikan, Katie (Josh) Temple, Connor & Lily, Emily (Chad) Deaton, Sydney, Nate, Evan & Travis, Zach and Josh; Christine (Christopher) Durham, Angela, Abigail and Cameron, Aleta (Sabian) Farhood; Steven (Carolyn); Marlene (Kenny) Funk, Anna and Theo. She is preceded in death by her husband, her parents and six brothers and sisters. She was an active member of the Christian Church (Disciples of Christ) in Colorado Springs for nearly 70 years. 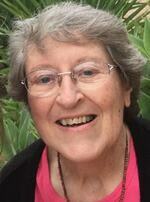 She served as a participant and officer of Church Women United for 30 years. Nancy could play a mean game of cards, horseshoes and Rummicube. She was deeply faithful to God and her church through service and leadership. She was an exceptional friend. As a mother, grandmother and great-grandmother she was generously loving, occasionally grumpy and always looking out for our best interests. Nancy came alive in a special way when she would talk about family genealogy, especially when it included pictures. For her life, so well lived, we are eternally grateful. All are invited to a light lunch reception immediately following the service in the VCC Fellowship Hall. In lieu of flowers donations can be made to Tennyson Center for Children at Colorado Christian Home or Village Christian Church. To send flowers to the family of Nancy Elizabeth Urban, please visit our Heartfelt Sympathies Store.